I’ve listened for over a week now as the media has crucified Penn State students, alumni, and fans as uncaring and out of touch with the rest of the country. Why are so many supporting Joe Paterno when he apparently failed to follow up on the abuse? Why are they upset about Paterno being fired? How can they think that football is that important? Why aren’t they focused on the abused children? I think the media’s missing the point. No decent human being could hear the horrific news out of Happy Valley without being outraged by abuse of young boys. No decent human being could read the Grand Jury’s report without grieving for the lost childhoods of Victims 1 through 8. Nor could anyone read the report without agonizing over why so many people, who could have stopped the abuse, apparently failed to act. Surely, most Penn State students, alumni, and fans are decent human beings. I think that I am also. 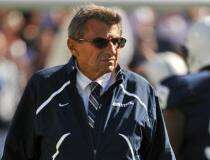 So, why am I still mourning not only for the young men, but also for Joe Paterno? It’s complicated. In the early years of marriage, my husband and I spent a few days each summer in State College shooting in the PA State Archery Championships. We stayed in the dorms and competed on the Blue Band practice fields. We ate ice cream every night at the Creamery. We bought Penn State sweatshirts and wondered if any of our someday kids would go there. Never really die-hard football fans, we began to watch Penn State games as a way to link us back to the good memories we’d made together. And then years later, our three sons attended Penn State as students, so State College once again became a mini-vacation destination, complete with lunch at Ye Olde College Diner or dinner at The Tavern. Slowly, we wove the town, the team, and JoePa into our lives. Whether he wanted it or ever intended it, sometime over his sixty years at the institution, Joe Paterno became the face of the university and all that is good about Penn State. He accepted a reasonable salary and lived a modest and quiet life. He stressed academic achievement to his players and created an atmosphere which helped them succeed. He and his wife shared his financial success with the university and community with generous donations. JoePa became the favorite uncle, the respected father, the revered grandfather, or the trusted friend to hundreds of thousands of people who created their own memories at Penn State. When the news first broke about the scandal, the media just didn’t give us time to mourn for JoePa. Most of the media and much of the nation clamored immediately for Joe’s head for his apparent lapse in moral responsibility. They screamed nasty judgments on those of us who wavered about what to do about Joe. They claimed that we just wanted to win more football games. Forgotten or ignored was how it feels to learn that someone you love and trust may have behaved inexcusably. I took four days to pass through the five stages of mourning. Denial? JoePa must have acted responsibly; the media must be wrong. Anger? The media should give him time to defend himself before persecuting him. Bargaining? Give him more time to explain what happened and I’ll still support him. Depression? After reading the Grand Jury report, it’s almost impossible to imagine a scenario that give’s Joe an absolute moral pass. Acceptance? Joe had to go. I came to that decision with a heavy heart, but still hope that Paterno can prove that our trust in and respect for him were well placed. Imagine that your allegiance to JoePa mirrors your relationship with your father, grandfather, brother, uncle, or good friend. The decision to stand by him has little or nothing to do with football. It doesn’t lessen our concern for the abuse victims. It doesn’t make us bad people. It just makes us good human beings sticking by someone we love at least until there’s no possible reason to believe.